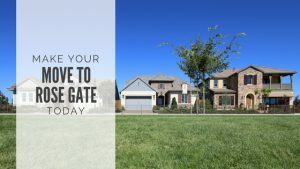 Rose Gate is a celebration of all that makes living in Lodi special and has been very popular with homeowners. Rose Gate is a thoughtful and friendly neighborhood with vintage touches like separated sidewalks, classic street lighting and landscape edges, many shade trees throughout the neighborhood, flowering roses and enticing open spaces. The Florentina has 3 bedrooms, 2 baths, and 2,129 square feet. The single-level, Americana-style home has designer select tile and carpet throughout the main living areas, a dedicated den that’s perfect for a home office or library. The open kitchen features GE stainless-steel appliances in the kitchen with a walk-in pantry and winter white cabinets with a stylish contrasting Battleship Gray island. The Master bedroom is spacious with a luxurious master bathroom with a spa shower and designer-select framed mirrors. Outside, there’s a California Room which is prewired for a ceiling fan. The Crescendo has 4 bedrooms, 2 baths, 2,233 square feet. Another single-level beauty, this home features a garage with extra storage (who doesn’t need extra storage? ), and a Tuscan-inspired style with stone veneer. Inside, the great room is prewired for surround sound, and the kitchen has GE stainless-steel appliances with a walk-in pantry. This home is also filled with lots of details like crown molding in select locations, 6” hardwood plank flooring in select locations, designer-select tile in master bathroom, laundry, and second bathroom, and designer-selected farmed mirrors in the master bathroom. The Legend features 4 bedrooms, 3.5 baths, and 3,545 square feet. This two-story, cottage-style home is a must see! This home is built on an oversized lot with a large side yard Downstairs, there’s 7.5” wide French Oak hardwood floors throughout the main living areas, surround sound in the great room, a dining room with French doors to the courtyard, and GE Café stainless steel appliances and quartz countertops with marble backsplash in the kitchen. There’s even a project room off the garage that you can use as a workshop or other special purpose. There’s more to see upstairs! Along with the remaining bedrooms and loft, the master bedroom is a true treat. The spacious bedroom features a luxurious bathroom complete with a freestanding soaking tub, quartz countertops, and upgraded brushed nickel plumbing fixtures and trim throughout. The California room allows you to extend your living space outside. It’s prewired for audio and includes a fireplace. If any of these homes caught your eye, reach out to our Sales Agents to schedule an appointment by email or phone at (209) 933-1715.